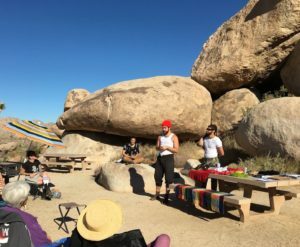 They say the desert makes characters, and at a recent performance art workshop in Joshua Tree National Park, I felt myself becoming one. Part of living in the Southern California desert area includes allowing lots of travel time to make it across the long distances of sand and rock. I still hadn’t embodied this as I raced along the roads in 29 Palms, then into Joshua Tree National Park. I hoped my cell service didn’t cut out before my Google navigation app brought me to Cap Rock, the location of the Sunday morning program Artists’ Tea, where artists give talks on their work and process, and presenters and attendees are provided tea and snacks. That Sunday morning’s program included Bashir Naim and Shamu Azizam, performance and experiential artists who live in Twentynine Palms (the same town I am living in during my desert sabbatical). I had eyeballed the map online last night and thought “Twenty minutes at best,” but nearly forty-five minutes later (and fifteen minutes past the scheduled start of the workshop), I was anxious and feeling silly for not having left earlier and mentally sussing out the person who schedules events deep in the Park at 9am on a Sunday morning. I arrived, got out of my truck, and approached the group of ten people who sat in folding chairs in front of a giant, sand-colored boulder. “Am I in the right place? Is this Artists’ Tea?” I asked. I realized the workshop hadn’t started, so I relaxed a bit as I looked around at the small butterfly chairs and camp stools arranged in a semicircle on the hard sand. A few Joshua Trees and weirdly shaped granite boulders dotted the otherwise empty landscape. I didn’t see the workshop leaders (whose picture for the event on Facebook showed them wearing bright red masks with horns). “Our artists haven’t arrived yet,” said Doug from his position at the camp stove. He didn’t seem too phased about the lateness on my part (or theirs). So I sat down. And waited. There was some friendly back and forth banter among the group, and I could tell that they were locals, resident creative types. I wasn’t quite awake (I had rushed to get there and didn’t have my morning coffee) and I wasn’t quite self assured (although I had been in the area for two months, I still felt very much like a tourist, so part of my daily interaction involved a huge amount of distance and observation before interaction). It took me a few minutes of sitting down to realize that the sun was blazing. I had sunglasses but not a hat. My head was on fire. I occupied myself with trying to find the right angle of shade from a nearby Joshua Tree, but that wasn’t happening. The trunk’s branches sprouted spiky leaves in tufts. It didn’t make shade. I knew there was a beach umbrella in the back of my truck, a bright rainbow-colored one, and I thought twice about drawing attention to myself by using it—but I didn’t want to be uncomfortable so I went to get it. I sat down on the mini-fold-up stool with my oversized shade maker. A few people looked at me and smiled. I felt like a crazed New Yorker in the desert surrounded by chilled-out Californians. Around half past nine, a small, four-door car pulled into the parking lot. “Here they are!” said Doug. I turned, watched two young-ish looking people get out of the car, one holding a duffel bag. As they walked up and through the semicircle, they introduced themselves as Bashir and Shamu. Their voices were soft and sweet. They didn’t look like the event picture, but what could I have expected? They were wearing masks in it. They helped each other unload the contents of the bag onto the picnic table: a latex spike collar, a gold lame piece of fabric, the red horned mask. Additional pieces of costumes from their drag acts. Then they looked at the group, thanked us for coming, and briefly spoke about their backgrounds in dance and performance art. I couldn’t believe the difference in the demeanor of their arrival versus mine. I thought it was a cute and unique direction. There were some chuckles around the group, but everyone did just that. I made a scratchy noise. I’m not sure where it came from; it just seemed to come out of me. The mood of the group was already light, but then it turned jovial. I suddenly felt like I was in an adult play group. As I sat and listened to their vision for the workshop (to encourage us to create characters based on landscape in the desert), I felt myself mentally sliding into the role I occupied at that time: a wound and cranky tourist with a huge and showy umbrella, sitting in the serene desert on a sunny Sunday morning. I thought, “What would this character need to overcome the situation?” and immediately I knew: confidence and self assuredness in their actions. I shifted my gaze to the props on the table, so I’m not sure who (Bashir or Shamu) said, “Performance is consciousness expanding. We get to be that person (or have a role or act through whatever we desire) to have the experience we desire.” I started to drift into the heart of the statement, felt myself vibing with what he was saying. He continued, his words melding with my growing enthusiasm. He was saying something like Create a persona that is powerful. Put that on. Own it. And once you have that memory, it enriches who you are. That expands your consciousness. I straightened up in my fold-up stool. I straightened my bright, showy umbrella. I made my name-noise quietly to myself. I noticed that I felt less anxious than when I had arrived. We were invited to come up to the table, pick up a prop, connect with it, see what it made us want to do, and then, perform it out. I found myself drawn to the spiked collar which, when I connected with it, wanted to be put on my thigh (not neck). I felt myself wanting to move, and I explored that. My motions were sharp and jarring, like the leaves on the Joshua Tree. And when it came time to perform¸ I felt my heart start to race. I almost passed the opportunity because I didn’t want to make a fool of myself—but the character I assumed in the desert is one who was as unapologetic as blaring sun and bleak, sprawling landscape. I stood, did my jerky-inspired motion—and much to my surprise—dropped down to the earth. I did a series of backward rolls, rubbed my hands all over the ground and kicked up dust, shook my booted foot violently then got up and gracefully, calmly, smoothly sauntered back to my pop-up camp stool. Yes, I meant to do all of that. A few members of the group clapped. As I sat down, I felt proud. I re-grabbed the umbrella, which felt smaller, less ostentatious, (I realized) was actually kind of perfect. I wondered why I had made such a fuss. And as I watched the next group member perform, my inspiration grew. Moral of this post’s story: go for it. The more I reflect, the more I realize how silly the anxiety made me think. Beach umbrellas are MADE for sandy environments and bright skies. I believe it was simply the act of holding the oversized umbrella that made me janksy. (I eventually found a way to wedge the pole in the grill behind me, so I wasn’t holding it the hole time.) But this a great opportunity to deconstruct anxiety, notice how it influences our thoughts, and acts as a sort of anti-imagination: it makes us think small versus BIG. I encourage this type of reflection & exploration during during EVOLceremonies. Sometimes the guided meditation prompt will allow-ask-explore you to be different versions of yourself. I say that that can be the you who has successfully manifested your desire—“What would your life look like then?” Sometimes I say to simply imagine a different scenario, and I do this because the faculty of imagination wanes in our adult years. It’s as if we lose the ability if we don’t use it. It’s as if acting, performing, just going for it are shamed. What I’m encouraging here is to find spaces to also perform what you’re imagining. Go for it. Take the person/vision/character you work with a guided meditation andbe it. Have the experience that is tugging at your emotional body. Then embody it. And if more people did, we would help others, too. Expand consciousness. It’s infectious. The experiences grow and we grow. Post photo credits: Artists’ Tea Facebook event. This piece was originally published on the EVOL website (www.evolxoxo.com).